Geraldene Holt is an award-winning English food writer and journalist. Several of her books have been have been translated into twelve languages. She is renowned for her practical and thoughtful approach to the domestic skills of baking, country cooking in France and England, and growing and cooking food, particularly culinary herbs. Some of her books are considered modern classics in the field. Geraldene Holt’s titles include French Country Kitchen – with an introduction by M.F.K.Fisher, Recipes from a French Herb Garden, The Gourmet Garden, Diary of a French Herb Garden, Complete Book of Herbs, Country House Cooking, A Cup of Tea, Geraldene Holt’s Cakes, and West Country Cakes and Assorted Fancies. Geraldene originally trained a potter and teacher, until a blizzard swept through the pottery attached to her thatched farmhouse in Devon, destroying months of unfired work. Taking refuge in her warm kitchen, Geraldene began to bake cakes, scones and biscuits to sell in the local market in Tiverton. When a publisher learnt of the success of her cake stall, Geraldene was invited to write her first cookery book which became a Penguin best-seller and was described by the cookery writer, Margaret Costa, as ‘a welcome breath of the fresh air of real life’. Thus began Geraldene’s new career as a food writer and cookery correspondent for leading magazines and newspapers. 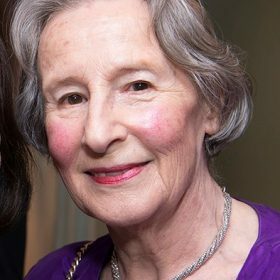 Geraldene is a founder member and former vice-president of the UK Guild of Food Writers, founding trustee and presently chair of the Jane Grigson Trust, founding chair of the Oxford Symposium on Food & Cookery Trust, and a visiting fellow in Food Studies at Oxford Brookes University. Geraldene Holt now divides her life between Oxford and the village of Saint Montan in France.